(CNN) -- The anti-government protesters who have streamed into streets across Iran to protest this month's presidential elections as rigged represent a small minority of the nation, Iran's ambassador to Mexico, Mohammad Hassan Ghadiri, said Wednesday. 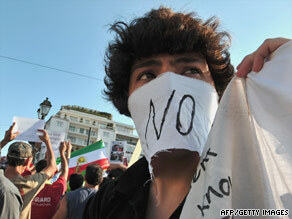 A supporter of Iran's defeated presidential candidate Mir Hossein Mousavi protests in Athens on June 23. "The minority can't impose their opinion on the majority," Mohammad Hassan Ghadiri told CNN en Español. "They can't impose a dictatorship saying that the majority is not going to govern." There are acceptable ways of addressing electoral fraud, if any occurred, he said. "But they go out on the street, they attack buses, they attack banks; that affects the security of the country." He added, "The law doesn't permit terrorism. It doesn't permit attacks on innocent people." He rejected assertions by the opposition that the election results showing Mahmoud Ahmadinejad winning by a landslide were rigged, pointing to a poll published in the Washington Post three weeks before the election that showed the incumbent with a commanding lead. "The minority has lost the election, they have to accept the role of the majority," he said. "If there was fraud, they have to show it. They have no proof." Asked why the government has made it impossible for nearly all international journalists to report from Iran, he accused the media of not accurately reporting events. "In Tehran, there were much bigger demonstrations in favor of the government that you didn't report about," he said. Asked about the shooting of the 26-year-old woman whose death captured on video has come to symbolize the anti-government forces, he said, "It is not clear who killed who," he said, adding that "terrorists" were among the demonstrators. "Some armed people have attacked police," he said. "Naturally, we have to respond." In an interview with CNN International, he was more blunt about accusations of brutality by government forces: "We do not beat up our people and we do not kill them," he said.